Hayward Industrial Products, Inc.Loc bulkhead fittings with Viton® seals offer excellent protection from aggressive chemicals. Piping systems conveying highly corrosive fluids can be safely connected to tanks or other containers with this new fitting without fear of seal deterioration. 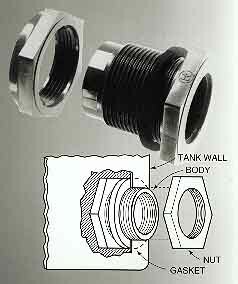 The fittings permit safe, quick piping connections to plastic, metal or fiberglass tanks. Only one person is needed to install the fittings due to a hex shape on the body portion of the fitting that allows it to be gripped from the outside of the tank while the nut is tightened.